President Ram Nath Kovind presented prestigious Padma awards to 43 personalities at a civil investiture ceremony at Rashtrapati Bhavan Monday evening. Cricketer Mahendra Singh Dhoni, billiards champion Pankaj Advani, eminent painter Laxman Pai, Singer Sharda Sinha were given Padma Bhusan. Former Russian Envoy to India late Alexander Kadakin was given Padma Bhusan posthumously. Film and Television Actor Manoj Joshi, professor emeritus of Osaka University in Japan and an expert on Indian languages Tomio Mizokami, Malaysia’s famous Indian classical dancer and choreographer Ramli Ibrahim, Kannada lyricist Doddarange Gowda, leprosy crusader from Chattisgarh Damodar Ganesh Bapat, photojournalist Zaverilal Mehta, wildlife conservationist and herpetologist Romulus Whitaker were among others who were given the Padma Shri. Vice-President M Venkaiah Naidu, Prime Minister Narendra Modi, several Union Ministers and other dignitaries were present at the ceremony. As many as 84 Padma awards were announced this year. 43 of them received the award from the President last month. 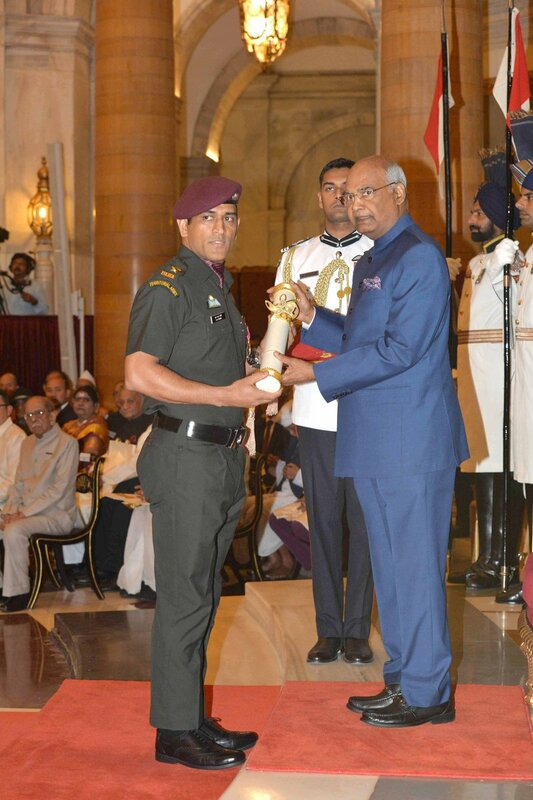 The Padma awards list comprises three Padma Vibhushan, nine Padma Bhushan and 72 Padma Shri awards. Keeping its promise of honouring unsung heroes, the government this year honoured with Padma awards several personalities who served the poor, set up free schools and popularised tribal arts globally.